Cars Of The Future Are Here! We are all one step closer to driving cars of the future thanks to the University of Michigan, which just opened what they are calling "M City." 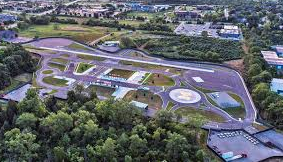 Situated on 32 acres, "M City" is a simulated town designed specifically to allow for the testing of autonomous (self-driving) vehicles. The facility includes realistic traffic features such as merge lanes, stop lights, intersections, roundabouts, road signage, a railroad crossing, building facades, construction barriers and mechanical pedestrians. According to the online news source, Automotive Fleet, M City is a joint project between the University of Michigan's Mobility Transformation Center,the Michigan Department of Transportation, and several major automakers including Ford, General Motors, Honda, Toyota, Nissan, and Navistar are closely involved in this groundbreaking initiative. So, do you think our roads and highways are ready for "autonomous vehicles?" Are they right for you?